I’ve always had a fascination with villains and what drives them to become evil? Generally, they’re just so much more interesting than heroes. It’s hard to narrow a list down of the greatest super villains, but I’m the man drunk enough to try. Just a heads up before we start the list, that I’m not a comic book guy by any means, so a character’s villainy will be judged by their more mainstream examples of mischief! Just think of the things the Shredder could have accomplished if he wasn’t so preoccupied by those meddling Teenage Mutant Ninja Turtles. The Turtles were like the mutant version of the Scooby Doo Gang, constantly interfering with Shredder’s scheming. While the Turtles may battle other foes, the Shredder (aka Oroku Saki) was a constant presence on their mind, frequently causing havoc across New York City. 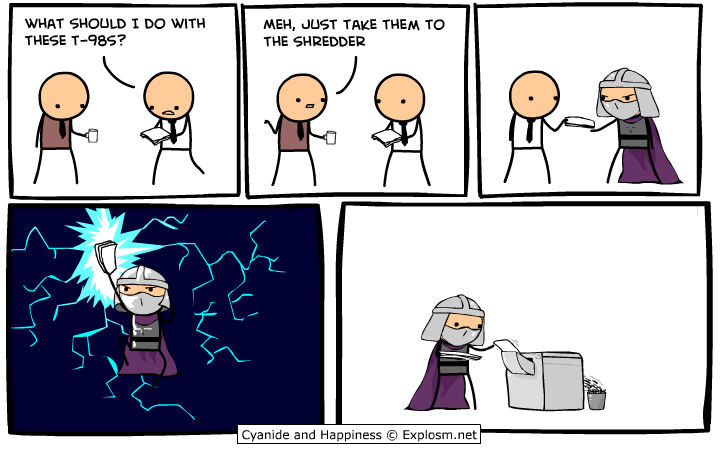 Shredder was bad enough… do we even need to bring up the actions of the Super Shredder!? You have to be pretty deranged to base all of your decisions on the flip of a coin. This is why NFL referees are so reviled! Two-Face (aka Harvey Dent) went from young, handsome, successful, and respected to a beast of a creature that is deformed and feared. He now hates the civil order he once enforced and is hell bent on destroying the Gotham City he previously protected. Harvey Dent still resides somewhere in Two-Face’s psyche, making for an interesting duality between good and evil, all fought within one man. It seemed like the Kingpin was always front and center, stirring the pot, when trouble was brewing. One of the best things about the crime boss is that he very rarely got his own hands dirty. Kingpin preferred to employ a series of henchman to do his bidding, while maintaining the public image of a successful businessman. 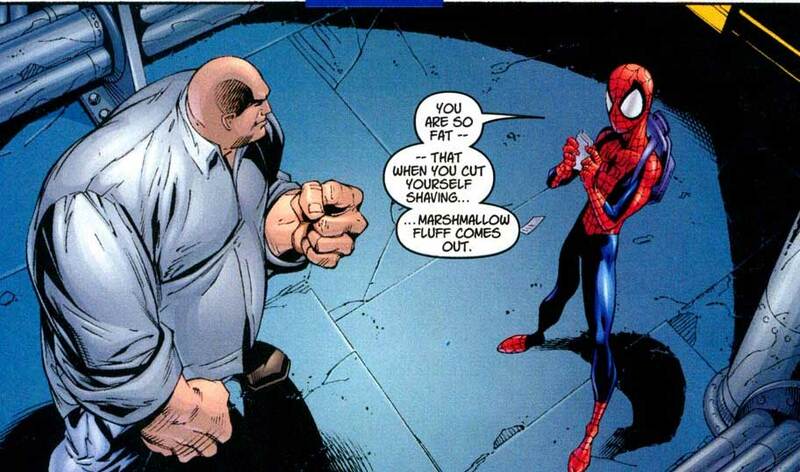 That’s not to say that Wilson Fisk, as he’s known to most of the world, can’t handle his own wars. He’s portrayed as being incredibly strong, while battling the likes of Spider-Man, Daredevil, and the Punisher. While he has sometimes crossed the line into good guy territory, Magneto’s end goal of a brotherhood of mutants that is no longer held back by humans (humans which Magneto would rather see eradicated from the world) drives him to perform all his misdeeds. His on-again, off-again friendship with Professor Charles Xavier is perhaps the only thing that keeps humanity alive within Magneto’s soul. It’s not surprising the mutant has suffered some psychological damage after surviving the Holocaust during World War II. Given Batman’s rogue gallery, it takes a pretty disturbed individual to take the mantle of the caped crusader’s arch nemesis. Pair him with the equally insane Harley Quinn and you have quite the deranged tandem. The Joker’s troubling reign of terror has spanned over 70 years. Whether portrayed by Cesar Romero, Jack Nicholson, Heath Ledger, or even Mark Hamill (that’s right, Luke Skywalker voiced the evil jester in the Animated Series), the Joker is equal parts fascinating and haunting… just the way we like him. Do you agree with the list? Clearly, my selections will ruffle the feathers of some super geek out there. I welcome the chirps. Bring it on! And by the way, the results of my ‘Which Super Villain Are You?’ (which I’ve linked at the top of this post) say that I’m Venom because strength, disguise and adrenaline are my greatest weapons! 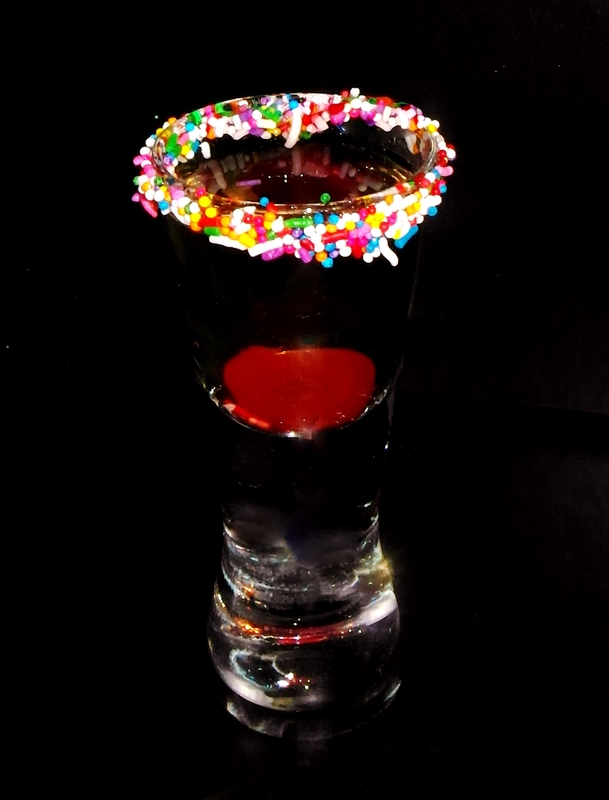 While I’m not sure if this recipe is actually meant to salute the infamous Joker, I’ve designed elements of it to better represent the Clown Prince of Crime. The Sprinkles, of course, represent all the wild colours he dons, as well as give a sense of the festive nature he would provide if he was a normal entertainer and not a psychotic villain. The Maraschino Cherry is the plush clown nose most entertainers adorn themselves with. As for the shooter, it wasn’t bad. I blended Jack Daniel’s Honey Whiskey with Bombay Sapphire East Gin. The Gin came in with its juniper taste at the end of the shot and while strong, was kind of tasty.